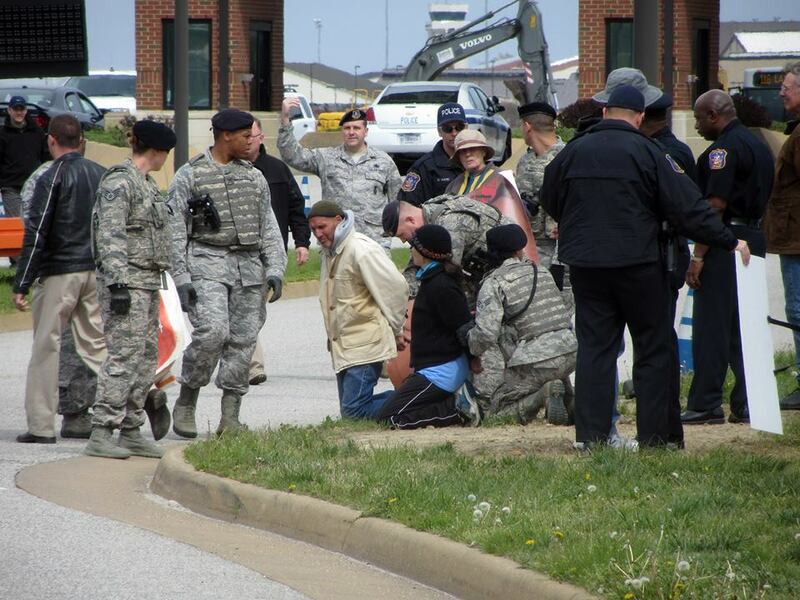 During Holy Week in Hampton Roads, Virginia, some 40 people walked part or all of a 53 mile Stations of the Cross, visiting 12 military bases, an Army recruiting center, and Lockheed Martin, as the 14 stations. At each military installation walkers remembered the crucifixion of Jesus, the crucifixion of humanity in war, and the Christian call to disarmament, nonviolence, and peacemaking. The pilgrimage ended on Good Friday at Langley Air Force Base in Hampton, part of the drone warfare network. Six people attempted to deliver a letter to the base commander addressing the illegality of drone warfare, and to block the gate going into the base with banners reading “Drones Crucify Christ” and “No War, No Drones, Love One Another.” Joan Wages, Bill Frankel-Streit, Srs. Carol Gilbert and Ardeth Platte, Russell DeYoung and Steve Baggarly took part in the action. There was joint local and federal jurisdiction in the area where they were arrested. Platte and Baggarly were charged with failure to walk on the left side of the street. They received summons’ to appear in Hampton Court on May 27. The others were released after being told that they would be notified of charges in the mail.